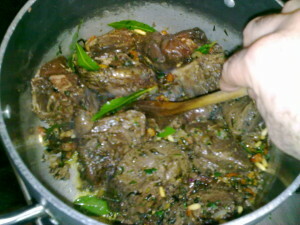 One day before you have to prepare the deer flesh (4/6 pounds – 2/3 kilos): first of all wash it in a bowl containing water and vinegar (half and half) then let it one hour in a colander to drip the water off. 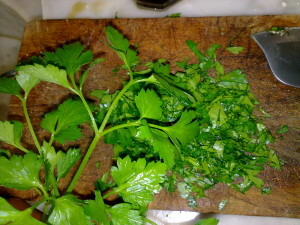 After this put the flesh inside a bowl and marinate it with: laurel leaves, rosemary, garlic, juniper berries, white pepper, onion, thyme,lemon juice (squeeze one fresh lemon) or balsamic vinegar (one small spoon) and one or two glasses of white wine. 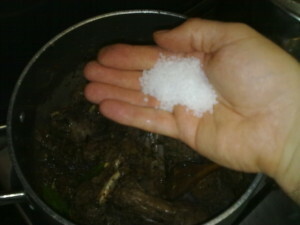 Do not put salt here. 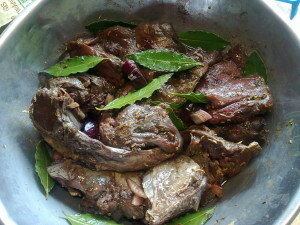 When you start in the morning, upside-down the flesh at noon and then again in the evening this in order to get all the flesh marinated. 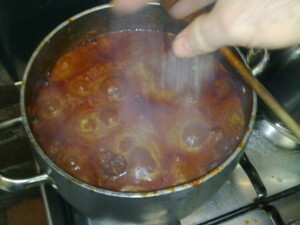 One day after use a colander to drip the liquid: personally I keep this juice and add it to the salmì, perhaps it is too strong for your taste so you can discard it and add wine insted. 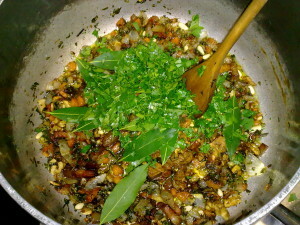 Discard the used spices and herbs. 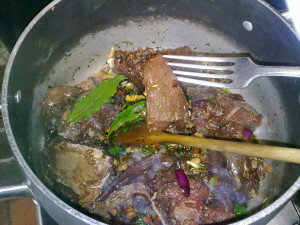 Prepare a broth using the deer fat and bones, two laurel leaves, two cloves of garlic, seven-eight juniper berries, few leaves of rosemary, seven-eight grains of black pepper, half onion, one carrot, marine salt (make it slightly salty). 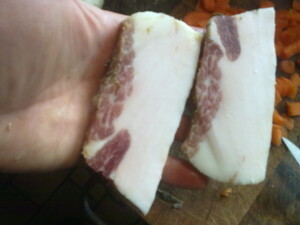 Cut in cubes 3-7 oz (100-200 gr) of pancetta. 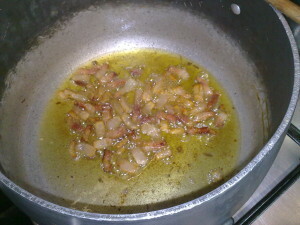 Let the pancetta to roast losing the fat. 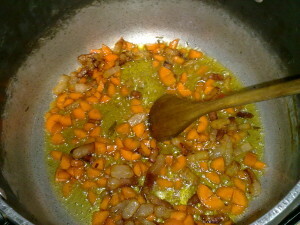 Add the chopped carrot (one or two). 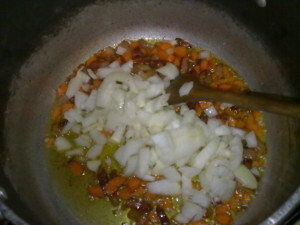 Add the chopped onion (one). 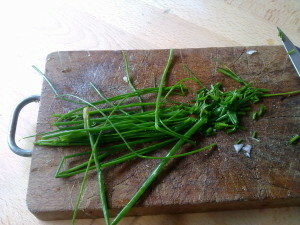 Chop the chives (a bunch). 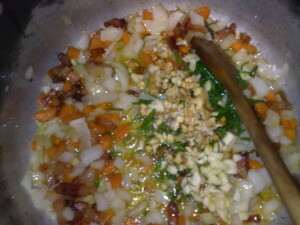 Chop the garlic (3-4 cloves) and the walnuts (3-4) too. 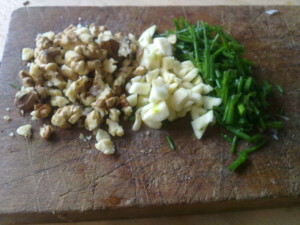 As the onion fades drop the chives, garlic and walnut. 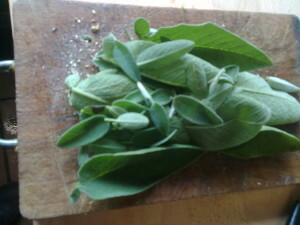 Also the sage (4-8 leaves). 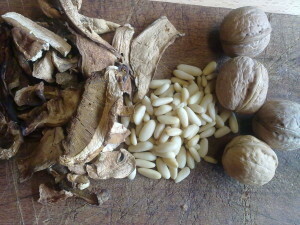 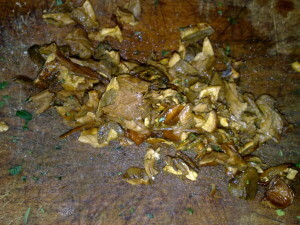 After revived in warm water, chop the dried mushroom (0.5-1 oz or 15-30 gr). 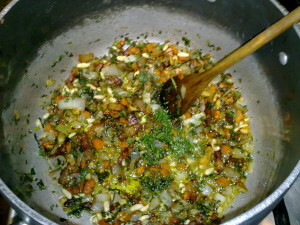 Add mushroom, parsley and laurel (4-6 leaves) to the “soffritto”. 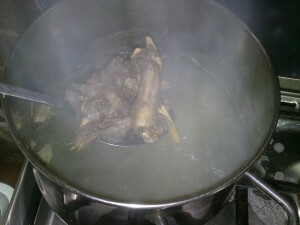 I will show you a technique to roast the flesh in a small pot. 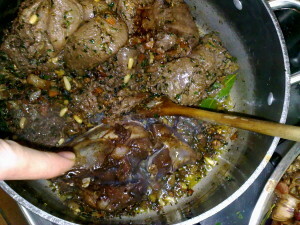 Start adding few pieces of flesh. 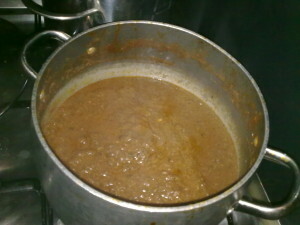 Stir and cook until the flesh becomes brownie. 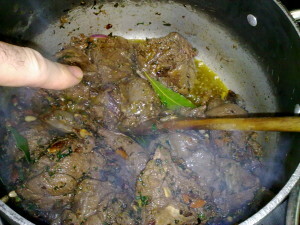 Using the wooden spoon move the flesh in one side of the pot making enough room to put more meat. 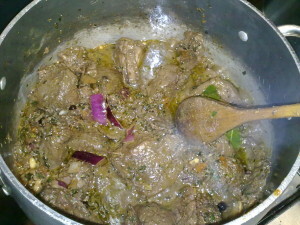 Add more flesh and cook it in that space. 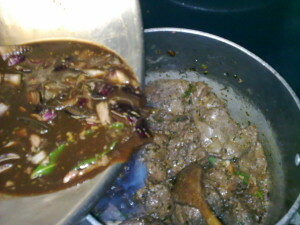 move the meat until it becomes brownie. 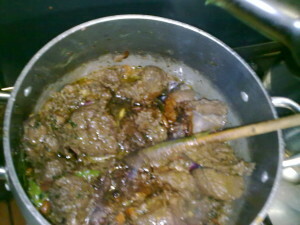 Make again space for more meat. 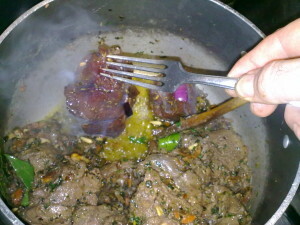 You will put the new meat right in that spot. 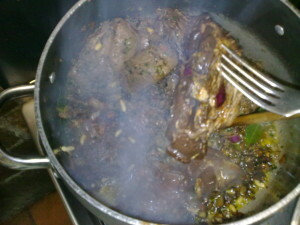 You have to roast all the flesh. 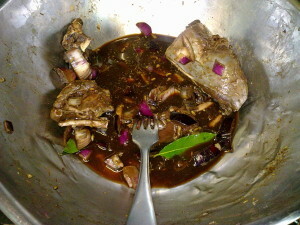 As the flesh is roasted you add the marine salt: half bunch seems adequate: be always careful you can add the salt in pinches and check the salinity later. 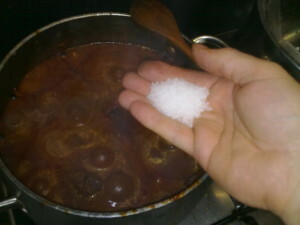 Add moresalt if needed and remember to do a last check just few minutes before the preparation is ready. 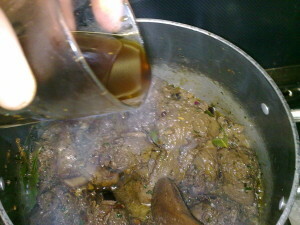 Also the residual of marinade can be added. 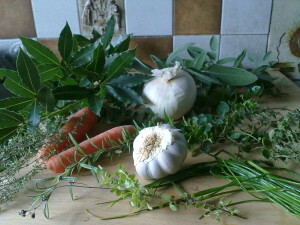 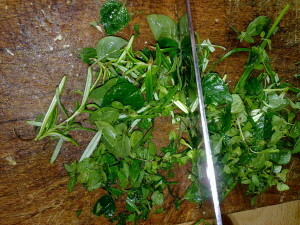 Add only the liquid: remember to discard the herbs. 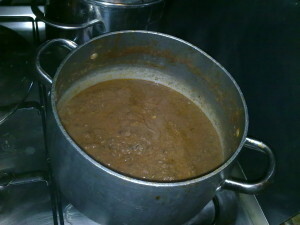 Now we are at good point: remember to roast the flesh mixing it with the “soffritto”. 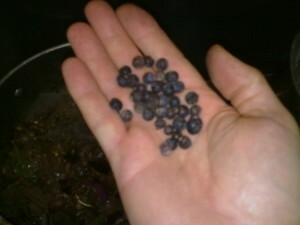 I like to add the juniper berries before now because I don’t wont it to roast in the “soffritto”. 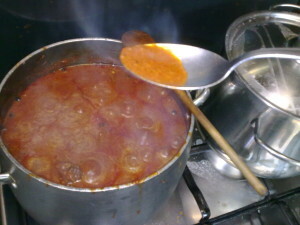 Stir and keep covered for one or two minutes with a lid. 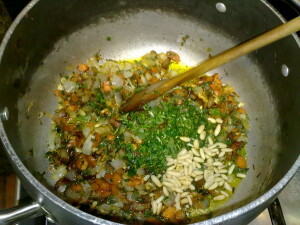 Remove the lid and cook other four-five minutes. 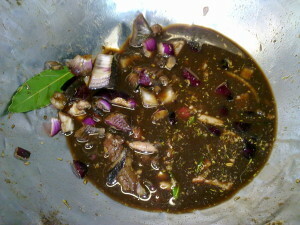 Then add one spoon of balsamic vinegar. 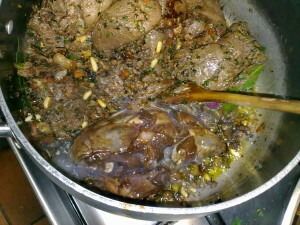 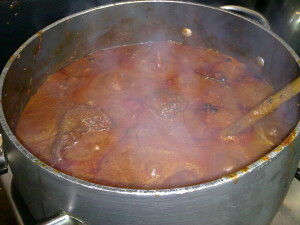 after two-three minutes the beef is ready: you can eat the “Deer In Umido” as main course now…but there is more…. 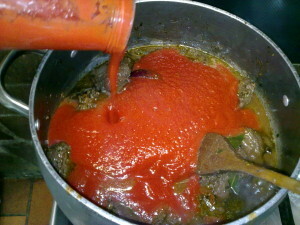 To end the salmì I add one liter of tomato juice or sauce, blended fresh tomatoes are always better. 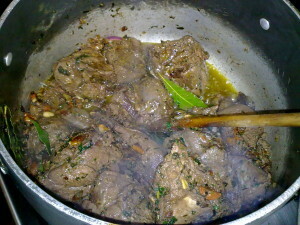 The sauce will boil soon. 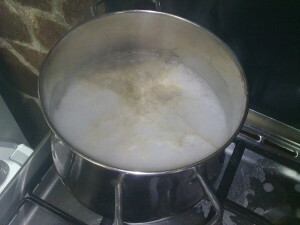 Keep boiling to reduce the liquid. 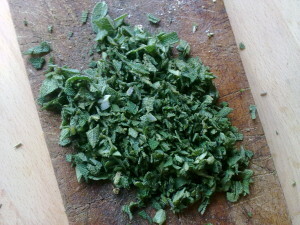 If needed add more salt in small quantities, stir, wait a couple of minutes then check again. 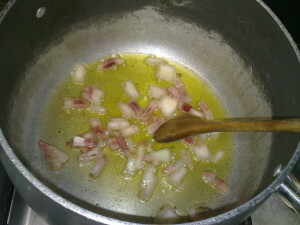 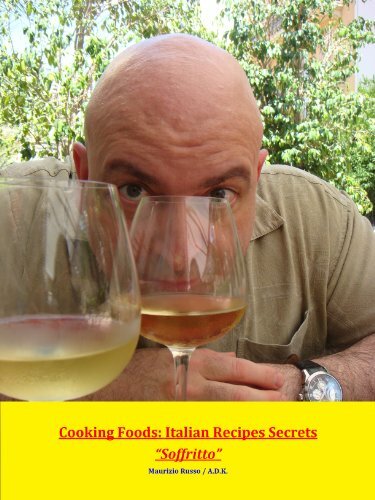 Besides the salt you can add white pepper or chilly or even more white wine now. 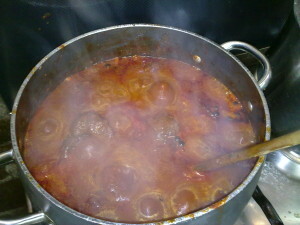 Keep cooking another four-five minutes. 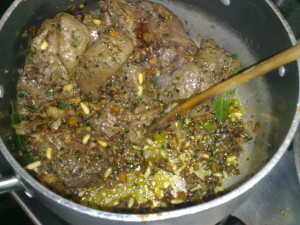 At this point the “Deer Salmì” is ready, you can use it as condiment for pasta or eat the meat as main course….but there is more…..
Take half of the salmì (beef and sauce) in to another pot. 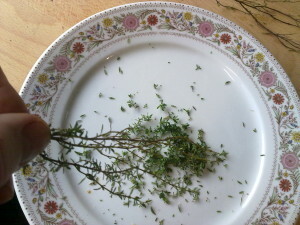 Remove all the laurel from it and the juniper berries too. 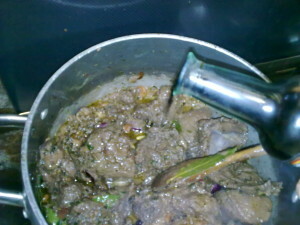 Use an immersion blender to chop small the meat. 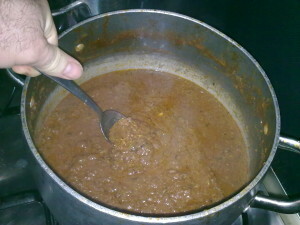 Add half glass of red wine (dry and strong like Barolo, Nebbiolo) stir, then add one small spoon of cocoa. 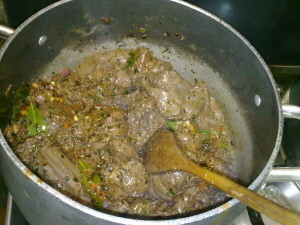 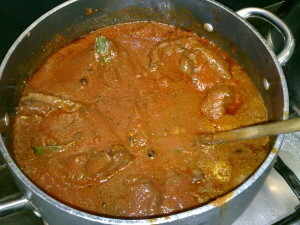 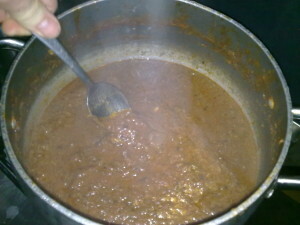 Stir well and cook slowly in order to reduce the sauce. 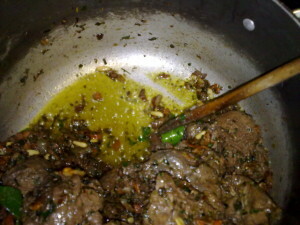 Few minute and another preparation is ready. 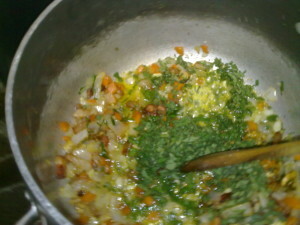 You can dress the pasta or eat as main course this superb sauce. 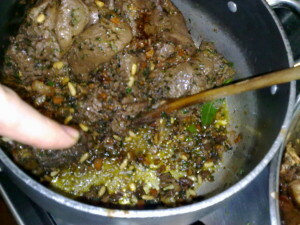 The Umido, Salmì & Civet are long and complicate preparations, they deserve care to pay-back giving us joy and happiness.